After the busy weekend we took a bit of a break from activities on Monday. We were scheduled to get our photographs taken Monday evening by a professional photographer I’d gotten to know via his blog a few years ago, so we didn’t want to do too much during the day. We had lunch at Portillos where Jill* works because I’d heard that their Italian beef was better than Beef Villa. It was very good, but there is something about Beef Villa I prefer. Then we drove to Sycamore to go to Farm and Fleet (a friend of ours once called it “Farmer’s Feet”, so that’s what we usually call it too). Bought some stuff we didn’t need (including a colorful pair of gardening clogs that I will wear the .001% of the time I actually garden). We stopped by and said hi to my dad and grandparents on the way back to Elgin, then headed to the kitty farm** for our photo shoot. Unfortunately the weather didn’t cooperate that day and we had to reschedule the photo shoot for the next morning — early the next morning since we had plans to visit Chicago later that morning. Bright and early Tuesday morning we headed back to the kitty farm and met up with James Jordan who made us look fabulous with an old barn as and equally fabulous backdrop. What you don’t see in the photos below are the occasional dead critters in the straw. Dean’s brothers (The Twins) stopped by for a visit and got in on the photography fun. After the photo shoot we picked up my mom and Brandon and headed to Chicago where we first visited Millennium Park and photographed the “Bean”, then visited the Art Institute. Unfortunately a considerable amount of time was spent waiting to be seated for lunch in the Art Institute’s courtyard cafe, waiting to be waited upon, and waiting for our bill. Oh yeah, it was Dean’s birthday. 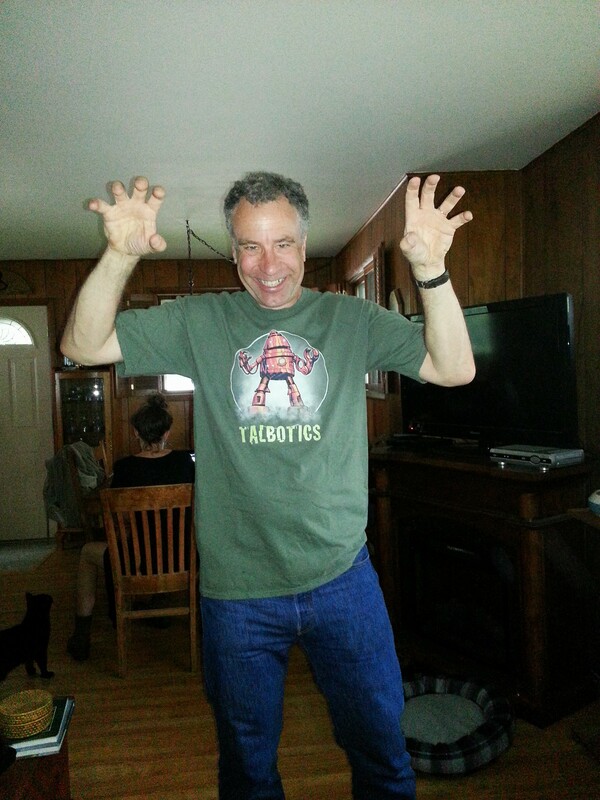 Dean modeling his new t-shirt from his robot-making buddy, Tal. That evening we celebrated June Birthdays in the Follmann family at Sue and Dennis’ house in Sycamore. Then we went home on Wednesday. **The kitty farm is the farm where Dean spent his formative years and where his brother, Danny and his family lived for many years. They always had dozens of cats running around — and that is where we got Joe and Halloween. What a fabulous idea for family pictures–you guys could be real Vermonters! Love love love these photos!